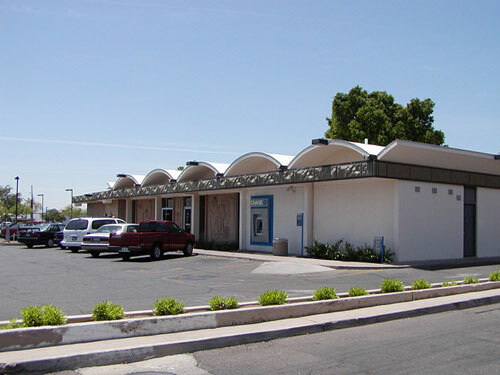 This former VNB Branch on 19th Avenue just north of Bethany Home, catter-corner from the former Christown Mall and in the shadow of the hospital, is not a large building so it doesn't qualify for spectacular modernist artifact. However, on a Saturday morning the small lobby is buzzing with activity and people with funny hats who enjoy air conditioning and the mood is friendly, for a bank. 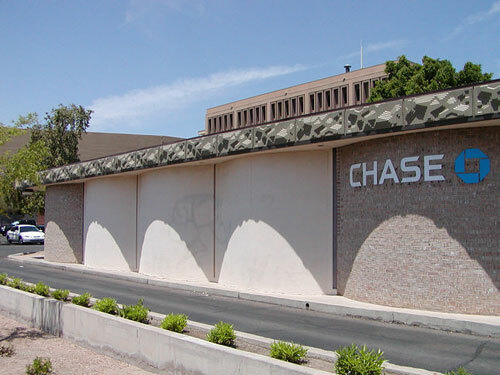 The Christown branch was indeed a former VNB and another Weaver and Drover building. Designer Frank Henry remembers it as a rather economical, small scale and simple building - too simple, tempting others to embellish it. 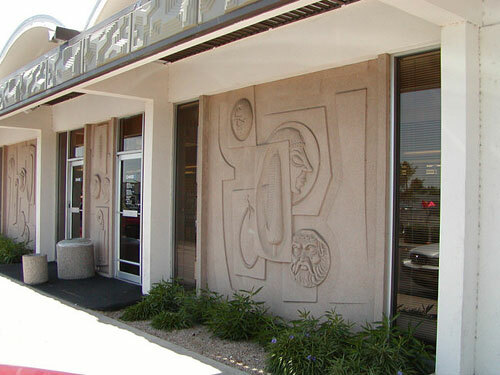 The original design did not include the relief sculptures. They came in a later renovation. The frieze around the top is, unfortunately, plastic and now broken in places. The roof shape is original, of course, and a nod to the rhythmic barrel-vault roof of the Kimbell Art Museum in Fort Worth, although Henry points out that the Kimbell is a little nicer. The roof creates a nice effect inside but the lobby is surprisingly small. 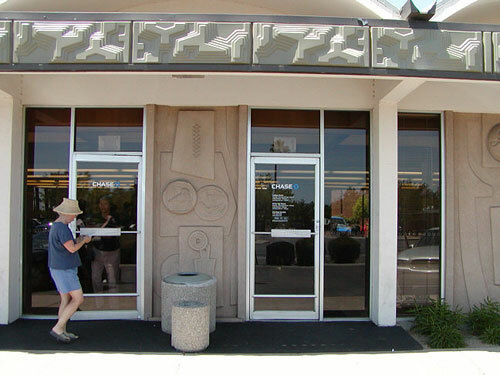 Those relief sculptures are in three panels, and the panels are repeated front and back. Guesses to their significance will be happily received and tabulated.